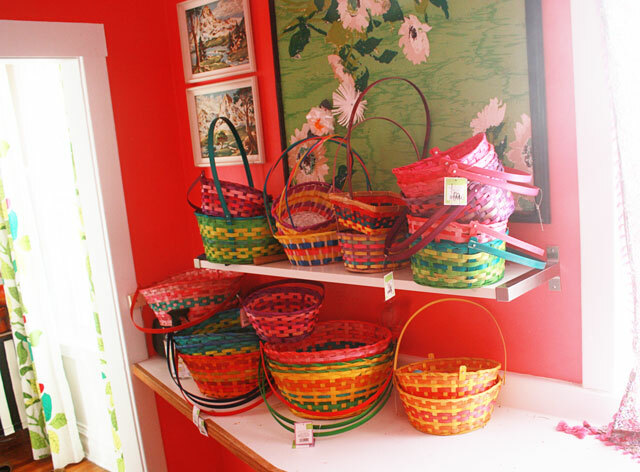 In early March, I made a mental note to pick up a few extra Easter baskets before the season was over. They are so colorful and cheap, I thought it would be fun to snip off the handles and use them to store potatoes and onions in the pantry. Good idea, no? So I got a couple. Grand total $3.19. What a bargain! As long as I was at Target again the following week, I grabbed a couple more. For the garlic, obviously. And then I grabbed one at the dollar store. For paper plates, of course. And then another one at the grocery store. For, ummm…sponges. …One month and 23 baskets later, I am now cleaning out my pantry and deciding if my coffee grinder warrants its own Easter basket. I’m heavily leaning toward YES. They look great all together as decoration. Oh, how funny. Definitely get one for the grinder. I suppose you would never consider painting them all one color? How about this: take three or four, cut the handles off and make them into one of those stacked hanging baskets that you put onions in. You know, the metal mesh ones all connected together like in a 70’s movie? You could also use them in the bathroom for things. Like your paintings. Love the color of the kitchen. I don’t understand why some people live without color. Put one on your vanity for sure, for all your perfumes, one for nail polish, one for lotions and put one in the bathroom for all of your items in there.Fill them with potpourri, spray paint (or not) and give homemade goodies/or gifts in a jar in them for your friends, great for Christmas. Of course use for crafts supply storage. Use one for fruit in the kitchen. You gotta do what you gotta do. I like to line them with plastic and use as planters. I hoard chocolate. Then I eat it, but only so no one judges me. That is the only reason I eat all the chocolate. After perusing thrift stores charging more than a dollar for used baskets, I wondered why? The 99 cents store has new ones for yes, 99 cents.